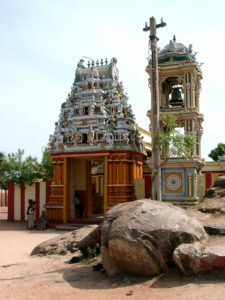 Koneswaram temple Trincomalee Sri Lanka (திருக் கோணேச்சரம் கோயில்). The temple complex is known locally as Konecharam Kovil (கோணேச்சரம்), the abode of Kona—Eiswara (the Chief Lord). Lord Shiva is known as Konesar (Tamil: கோணேசர்) (pronounced Konechar or Konasir).